Hockey, soccer or football players; the SPQ program is for EVERY athlete. 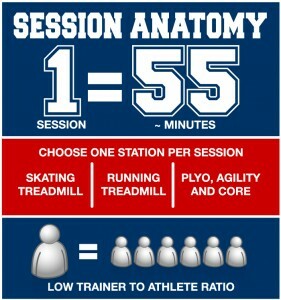 No matter how many sessions you sign up for, each session can be used for approximately 55 minutes of: skating treadmill, running treadmill or plyometrics. Plyometrics encompass core training, strength training, foot speed and conditioning. Certain athletes will also utilize our patented sport cord technology to improve coordination and explosiveness. Sport cords can be used at each station. If you’re new to Acceleration we suggest you first try our 18 Session SPQ Program. For the more dedicated athlete we suggest the 8 Week or longer SPQ Speed Pass. After you complete your first program you may want to consider the 12 or 6 Session Maintenance Program. This will help maintain the fitness increases from your first program. For all programs, sessions expire 6 months from start date. 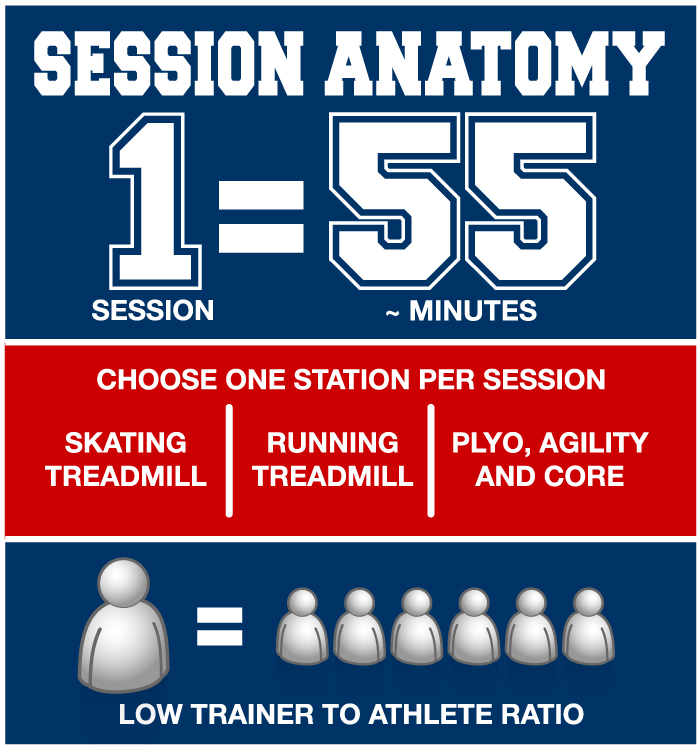 Each athlete will receive a customized program that includes pre and post testing on the skating or running treadmill and specific combinations of plyometrics customized to your sport. All programs will be tailored based on the age, ability and performance goals of each individual athlete. For a group discount, sign up together with friends or teammates. Click here to register an athlete. If you’re in a crunch for time or you are a multiple sport athlete and need to limit your training sessions to once or twice per week this is your program. This program also includes pre and post testing on the skating or running treadmill. Click here to register an athlete. Maintain your fitness throughout your season or after you’ve completed one of our other programs. Click here to register an athlete. With the Speed Pass you can utilize Acceleration’s skating treadmill, running treadmill and plyometric and agility training as much as you like for the length of the pass. You can still expect the same exceptionally low trainer to athlete ratio, one-on-one attention and tailored program; now you just get more of it. For best results we recommend at least 3 workouts per week and no more then 4. Sign up for a 4 week, 8 week or 12 week, 6 or 12 month Speed Pass and get unlimited training for the length of the pass. This is available year round for ALL SPORTS. Contact us for group and family discounts.